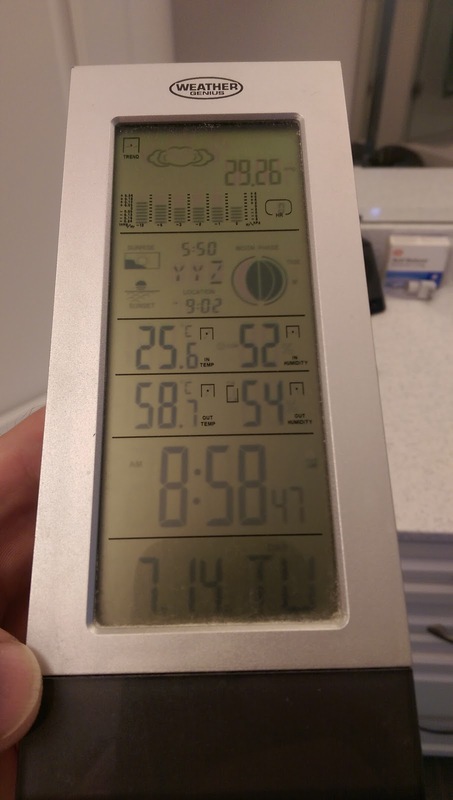 You'll notice that the temperature outside, showing in Celsius, is 58.7! After shaking my head and looking again, I took the picture so I could prove that my eyes were not fooling me. On later inspection I discovered that Parker had likely put the sensor on its side on the fence after picking it up off the grass. It was pouring rain this morning and water had seeped into the mechanism. So much for the really hot day I was expecting... turned out to only reach 30. And no, I wasn't just getting up at 9am. I was up just after 6 to take Wendy to work and to do some chores around the house. I seem to get less sleep now that I am unemployed.